Scotland has a distinctive look, one of rocky shores and a thick carpet of lush green grass. The Isle of Skye, located off the west coast of the country, is an example of the classic sights Scotland is known for. From the Glenfinnan Viaduct Bridge, immortalized as the train ride to Hogwarts in the Harry Potter movies, to the roving flock of sheep—the Isle of Skye holds sights that will be remembered by the traveler for years to come. Thanks to Globus,who offers up a stop by the Isle of Skye on a few of their tours, today’s 60-Second Geography is all about this land of faeries, castles, and mist. With peninsulas stretching out from a mountainous center, the Isle of Skye is not only a great sight-seeing opportunity but also draws in walkers and climbers from around the world. The mountains in the center of the isle are known as the Cuillin. These rocky ranges are divided into the Black Cuillin and the Red Cuillin. The Black Cuillin make up the primary part of the ranges and get their name from the igneous rock that forms them. At the foot of the Black Cuillins are the Fairy Pools, small falls that form crystal-clear blue pools. An appropriate name for a magical place within fairy country, the Fairy Pools should not be missed on a walk through the beautiful countryside. Many other walks will carry the traveler to ancient sites and landmarks that can be seen for miles around. One of the more popular areas on the isle is the northern peninsula named Trotternish. This area has a few sites for the traveler to take in along the route up to its northern-most point. The drive up to this point had been described as ‘intoxicating’ and ‘epic’. Stone bridges and castles offer a similar scene to the surrounding natural landscapes. One of the landmarks that are a must-see is the Quiraing. The Quiraing is a highly unique area that can be explored on foot with ease. After weaving through paths that meander by jutting rocks and valleys below, the pinnacle of the Quiraing will provide the traveler with a one-of-a-kind view of the area. The other star attraction of Trotternish is the The Storr. This rock formation can be seen from miles out, a stark difference to the green of grass below. In the same area is The Old Man of Storr, an ancient stone that stands alone like an antenna to the heavens. 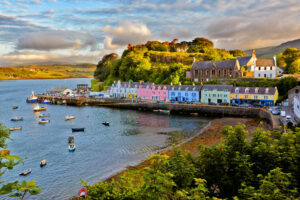 The capital of the Isle of Skye is Portree, a town located on the east coast overlooking a bay. Once a stopover port for Scots who were traveling to the United States to escape poverty, this town has become a more modern place where approximately 2,000 locals live and host travelers on their way to experiencing the gorgeous sights of the isle. The houses painted bright colors and quaint shops are a welcoming sight along the waters of Loch Portree. The traveler couldn’t ask for a better town to start their journey. Travelers looking for the lush green land of the faeries, the magical low fogs and mists across valleys, and rocky cliffs that line the isle will find a fantastic journey in a land spoken of in songs and stories since the days of old. That’s why Globus wants to open this experience to the traveler, with multiple tours heading to the Isle of Skye. You can find out more about these offerings here. With Globus, explore unhurried and uncrowded England, Scotland, and Wales to shop for bits and bobs only found in bonnie shires, hamlets, and highlands. Invite them to discover destinations they might not yet know about, or places they wouldn’t think of visiting on their own. Join the locals to hoist a glass in Scotland and haste ye back to England while we put the kettle on for a nice cuppa tea with a biscuit. Say, “Cheerio,” to typical tours for a better, brilliant way to see true life in England, Scotland, and Wales. Listen to Globus’ in-depth webinar recording to learn how you can help your clients discover Britain beyond London! Get a free e-brochure to put on your website, in newsletters and on social media.